Allotypes have been identified for the human IGKC gene and are designated as Km (for 'kappa marker') (previously Inv) [1-2]. Km allotypes are determined by the hemagglutination technique inhibition [3-4]. There are three identified Km allotypes: Km1, Km2 and Km3. They correspond to IGKC amino acid changes at position 45.1 and 101, according to the IMGT unique numbering for C-DOMAIN (Table). the two Km phenotypes observed when sera are only tested for allotype Km1. a Km alleles and genotypes were previously written underlined and using superscript (for example Km1/Km1). b Numbers of the Km allotypes and phenotypes are written between parentheses. Description of mutations for the Km alleles is according to the IMGT unique numbering for C-DOMAIN. Between parentheses are shown the expected mutations responsible for the Km1 amino acid changes. The C-KAPPA domain (encoded by IGKC*01) is from the b12 antibody (IMGT/3Dstructure-DB, code PDB:1hzh). 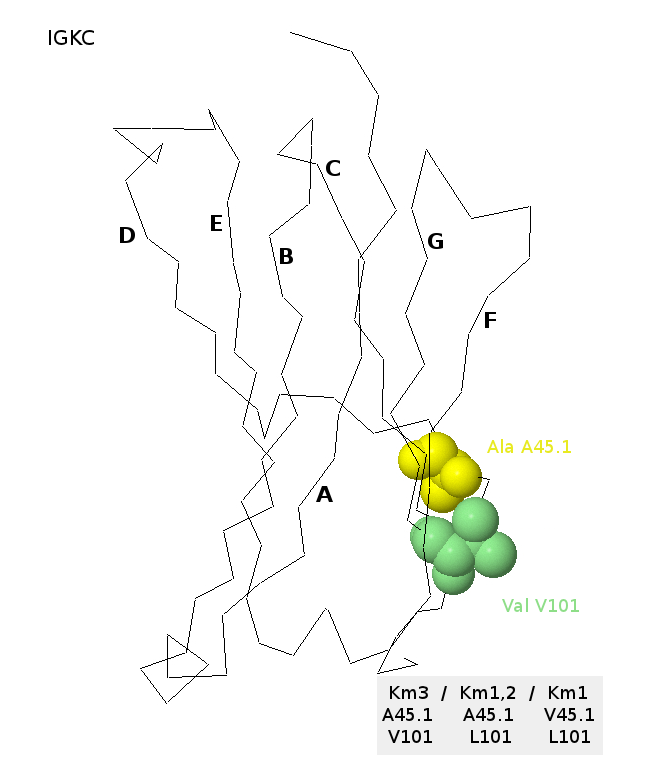 The alanine Ala A45.1 (strand CD) and the valine Val V101 (strand F) are shown . The A45.1 and V101 corresponds to the Km3 allotype. The A45.1 and L101 would correspond to Km1,2, and the V45.1 and L101 would correspond to Km1 . (1) Sera only tested for Km1 and Km2 allotypes. The Km1 and Km1,2 allele frequencies were calculated, and the Km3 allele frequency was deduced by difference. (2) Sera tested for Km1, Km2 and Km3 allotypes. (3) Another study on the same Tunisian populations provided similar frequencies . (4) Amino acid positions according to the IMGT unique numbering for C-DOMAIN  (in bold), to the IMGT exon numbering (between parentheses) and to the Kabat numbering (in italics). Characterization of amino acids for Km allotypes are from [25-29]. (5) Not sequenced at the nucleotide level. Expected codons are shown between parentheses (G. Lefranc and M.-P. Lefranc, 13/05/2003) . Ropartz, C. et al., Nature, 189, 586-587 (1961). Steinberg, A.G. et al., Vox Sang., 7, 151-156 (1962). Lefranc, G., Allotypes et haplotypes des immunoglobulines dans les communautés libanaises : intérêt exceptionnel en immunogénétique et séro-anthropologie. Thèse de Doctorat d'Etat es Sciences Naturelles. Faculté des Sciences, Université de Rouen, 21 mars 1978. Lefranc, G. et al., Acta Anthropogenetica, 1, 34-45 (1976) LIGM:3. Lefranc, G. et al., Hum. Genet., 50, 199-211 (1979) PMID: 511135 LIGM:9. Chaabani, H. et al., J.Immunogenet., 11, 107-113 (1984) PMID: 6427354 LIGM:25. Lalouel, J.M. et al., Acta Anthropogenetica, 1, 15-33 (1976) LIGM:2. Helal, A.N. et al., Exp. Clin. Immunogenet. 5, 1-14 (1988) PMID: 3155402 LIGM:55. Ropartz, C. et al., Acta Genet. (Basel). 13, 109-123 (1963). Ropartz, C. et al., Bull. Soc. Anthrop, Paris, 4, XIe ser., 458-469 (1963). Steinberg A.G., In Symposium on Immunogenetics. J.B. Lippincott Co. ed. Philadelphia (1966). Steinberg A.G. et al., Annu. Rev. Genet., 3, 25-52 (1969). Ropartz, C. et al., Hum. Hered. 20, 275-280 (1970) PMID: 4099120. Ropartz, C. et al., Hum. Hered. 20, 456- (1970). Ropartz, C. et al., Hum. Hered. 22, 508-518 (1972) PMID: 4206588. Steinberg, A.G. et al., Isr. J. Med. Sci., 9, 1249-1256 (1973) PMID: 4775108. Schanfield, M.S. et al., Hum. Hered., 25, 370-377 (1975) PMID: 1222944. Schanfield, M.S. et al., Hum. Hered., 25, 382-392 (1975) PMID: 1222946. Steinberg, A.G. and Matsumoto, H., Hum. Biol., 36, 77-85 (1964). Loghen E.van et al., Ann. Hum. Genet., 33, 351-359 (1970). Jenkins, T. et al., Am. J . Phys. Anthrop., 32, 197-218 (1970) PMID: 4191313. Daveau, M. et al., Hum. Hered., 25, 88-92 (1975) PMID: 1150304. Salzano, F.M. and Steinberg, A.G., Am. J. Hum. Genet., 17, 273-279 (1965). Salzano, F.M. et al., A.G., Am. J. Hum. Genet., 25, 167-177 (1973) PMID: 4120238. Baglioni, C. et al., Science, 152, 1517-1519 (1966) PMID: 5934342. Hilschmann, N. and Craig, L.C., Proc. Natl. Acad. Sci. USA, 53, 1403-1409 (1965) PMID: 5324619. Milstein C., Nature, 209, 370-372 (1966) PMID: 5920238. Milstein, C.P. et al., Nature, 248, 160-161 (1974) PMID: 4132042. Steinberg, A.G. et al., Immunogenetics, 2, 1-10 (1974). Lefranc, M.-P. et al., Dev. Comp. Immunol., 29, 185-203 (2005). Lefranc G. and Lefranc M.-P. The Immunoglobulin FactsBook, Academic press, London, UK, 458 pages (2001).